FRIDAY, Oct. 24, 2014 (HealthDay News) -- Infants with a specific skin gene mutation who are exposed to peanut protein in household dust may be more likely to develop a peanut allergy, according to a new study. Peanut allergy and other food allergies have been linked to severe eczema, a skin disorder, in early infancy, the U.K. researchers said. In conducting the study, researchers at King's College London and colleagues examined the amount of peanut protein to which 577 babies were exposed during their first year of life. This was done by measuring the amount of peanut protein in the dust collected by vacuum from the living room sofa in their home. The children were tested for peanut allergy years later when they were 8 and 11 years old. Their DNA was also checked for a specific skin barrier defect, known as an FLG mutation. Previous studies identified a specific gene that codes for the skin barrier protein, filaggrin. Mutations to this gene, known as the FLG gene, lead to a skin barrier impairment, which is thought to make the body more vulnerable to an allergic reaction. The study, published this month in the Journal of Allergy and Clinical Immunology, found that one in five children with peanut allergy had an FLG mutation. The researchers found that a threefold increase in exposure to peanut protein in dust in the first 12 months of life was associated with a threefold increase in risk for a later peanut allergy. They said, however, exposure to peanut protein in household dust had no effect on children who did not have a skin barrier defect from an FLG mutation. "Our findings provide evidence that peanut allergy may develop via the skin in children with mutations in the gene that codes for filaggrin which damage the function of this important skin protein," said the study's first author, Dr. Helen Brough, from the department of pediatric allergy at King's College London. "These findings are also an example of how an individual's response to their environment can be modified by their genes," Brough said in a university news release. "Our study raises the possibility of being able to identify a group of children with FLG mutations through genetic testing in the future, and altering their environmental exposure to peanut early in life to reduce the risk of developing peanut allergy," she added. The study offers further evidence for the dual-allergen-exposure theory, said the study's senior author, Gideon Lack, also from the King's College London pediatric allergy department. This theory "suggests food allergies develop through exposure to allergens via the skin, likely through a disrupted skin barrier, [and that] consumption of these food proteins early in life builds up tolerance in the body," he said in the news release. "Previous guidelines recommending that mothers should avoid peanuts during pregnancy and breastfeeding have now been withdrawn. Ongoing studies at King's aim to find if exposure to solids in early infancy might actually help to prevent allergies," Lack said. "It may be that the timing and balance of skin and oral exposure to a particular food early in life determines whether a child develops an allergy or tolerance to that food." 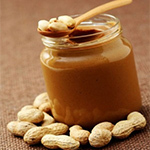 About 2 percent of U.S. children are allergic to peanuts, according to the news release.